I am a big fan of eBay. My collection of antique and vintage quilt tops has mostly come from eBay. In the years of looking at quilts on eBay almost daily I have seen a lot of them. I also am a member of a group on Facebook called “Quilts Vintage and Antique” This is a group of quilt Historians, collectors, dealers, certified appraisers and basic quilt heads like me….these people know quilts! Occasionally someone will post a listing from eBay and ask the group if anyone has seen it before, or if they have any information about it. Someone always does! A few days ago a seller on eBay listed a quilt that didn’t look right to one of the members so he posted it on the Facebook page with the note: recent import? A few of us had seen it before…the seller had it listed as: American Quilt folk art made in Missouri. Antique 1900 Victorian Turn of the century, probably 100 years old . When I was looking for other examples of this quilt on eBay I came across several others that are also being misrepresented. If only every seller was so honest!!! There are currently 2 other sellers with this same quilt….one listed as an antique, and one listed as being “Amish made” they have not yet responded to the letters. 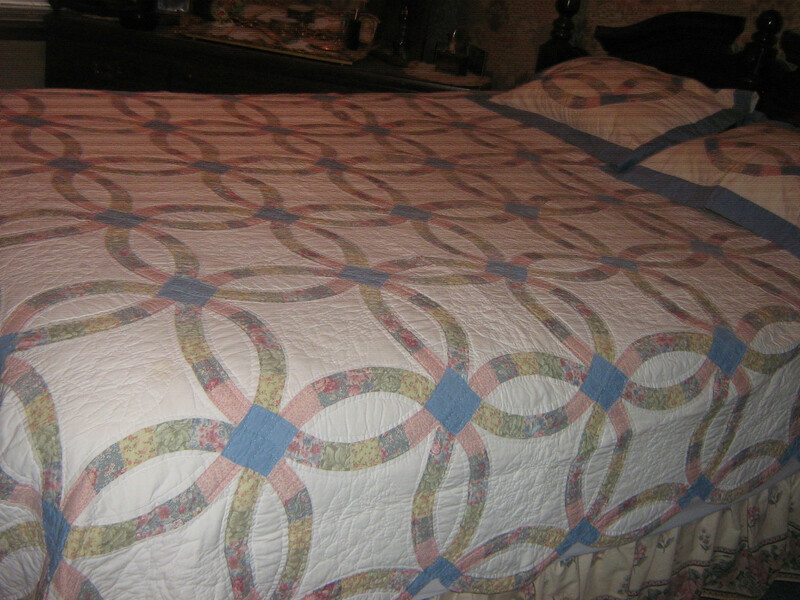 There is currently one listed that claims to be from 1900….the listing says : I purchased this quilt in an antiques store in Illinois and have since had a quilters organization appraise the work. Their conclusion was that this quilt was most likely made in the early 1900s, perhaps by a farmer’s wife or the Mennonite in the area. The cotton fabric (both front and back) and the colors used were consistent with that time period. 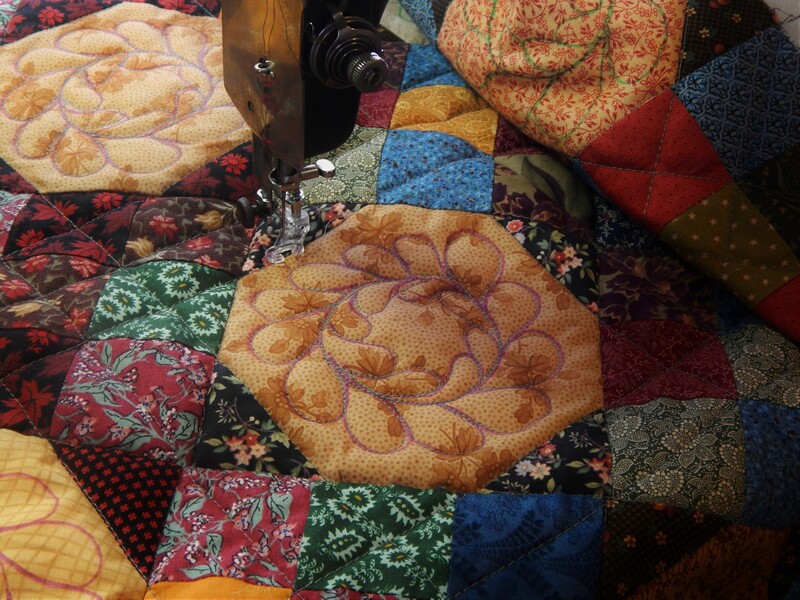 Although there is some machine work, a great deal of handwork has been done on this quilt as well. Based on the information given to me at the antiques store and the quilter organization appraisal in Brunswick, Maine, I re-placed this ad in good faith and will not be withdrawing it. I purchased this quilt in an Illinois antiques store near a farming community about 20 years ago. A year or two ago, I had this quilt appraised and specifically asked if it was a reproduction. After a very minute and thorough examination of the material and stitching, each member of the group in Brunswick, Maine, agreed that my quilt was a genuine antique. It is not surprising that the Chinese would reproduce an antique or this particular quilt pattern, but I am satisfied, based on the findings of the appraisers, that mine is the real deal. What’s amazing to me is that you cannot conceive that the Chinese based their reproduction on an actual antique and that you are unwilling to concede that I might actually have such a quilt. The experts I consulted with–after specifically being asked if it was a reproduction and they did a very minute and thorough examination of the fabric and hand stitching–concluded that I have an antique quilt. I would not be representing it as such if they had not made that their assessment. My goal was not to make this woman mad, it was actually to help her out. eBay sellers depend on positive feedback from buyers and they need to protect their reputation….I also wanted to protect the buyer because someone bid on it ($149.99) based on her incorrect description. So some eBay sellers are amazing people who really and truly want to be fair and honest and some are horrible liars and intentionally try to deceive. so quilt buyer beware!! I wrote a full page about how to look at quilts and see if they are new imported quilts and you can see it here: Quilt Buyer Beware If you have read it before it might be worth another look because I have added many new pictures. UPDATE! the seller did change her mind …here is what she wrote: Thank you for your concern. After praying again about this situation, I wrote to the sole bidder on the quilt this afternoon and alerted her to the controversy surrounding it. She was referred to the accusatory comments posted on the ad and was given the opportunity to back out of the contract. She wrote back this evening, thanked me for alerting her and indicated that she liked the quilt anyway and did not wish to withdraw. the last two quilts you show sure do not look like antiques to me – some people are honest some are not – and yes it is up to the buyer to try to make sure they know what they are getting. You and Teddy are great watchdogs for the quilting industry! Tim, you did the right thing, and your article will most likely help others who are looking at quilts online for purchase or sale. That lady “got her hands slapped” and doesn’t want to admit she’s wrong. Shame on her! Tim, Thanks for the education today! I seldom look at quilts on ebay but when I do I always find some that I think I would like to buy if I could afford to indulge my passion. But then I am wary and don’t bid. My collection so far includes family quilts handed down and what I have made personally. I did buy one small double wedding ring top at an antique store which I plan to finish. I am pretty sure the fabrics are from the 30s or 40s, comparing them to my grandmother’s quilts and my limited knowledge of fabrics. I have that exact Double Wedding Ring quilt. It was made in China and I believe purchased at a department store in the 1980’s. thanks for the words of caution. 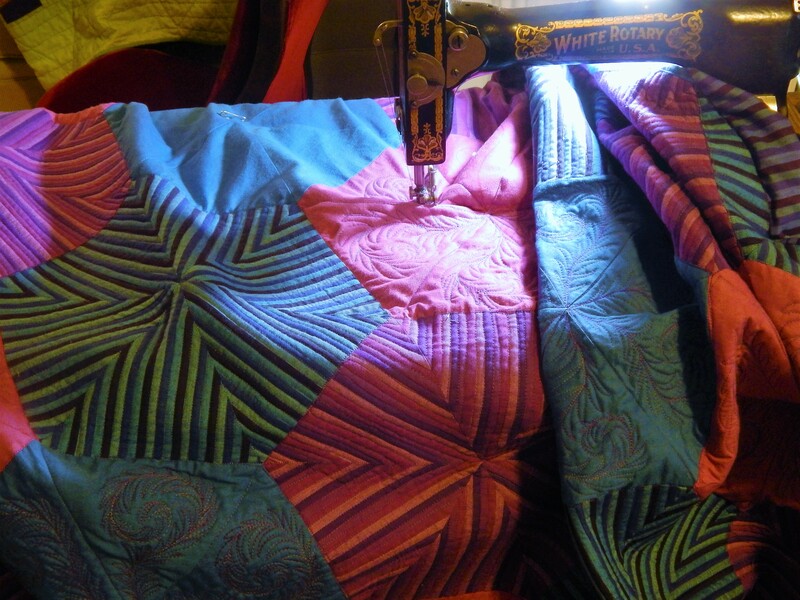 there is nothing wrong with the quilts …but it is good to know they were made in china and sold in department stores! I have that exact same Double Wedding Ring quilt. EXACT. Made in China, purchased in the late 1980’s I believe, at a discount department store. The so-called “experts” who “appraised” the quilt were not certified quilt appraisers. She just doesn’t get it. I’m lucky, because these mass-produced quilts just don’t appeal to me visually. There’s something about them that feels like their soul has been stripped away. 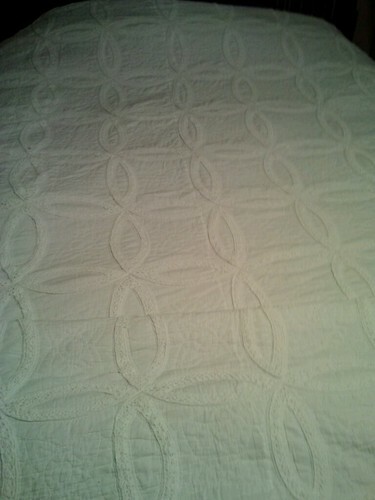 I have one mass-produced quilt, purchased knowingly because it was a New York Beauty. Otherwise, I wouldn’t bite. The worst is when someone brings one in to a quilt study day thinking it’s vintage. Ugh! So well said. 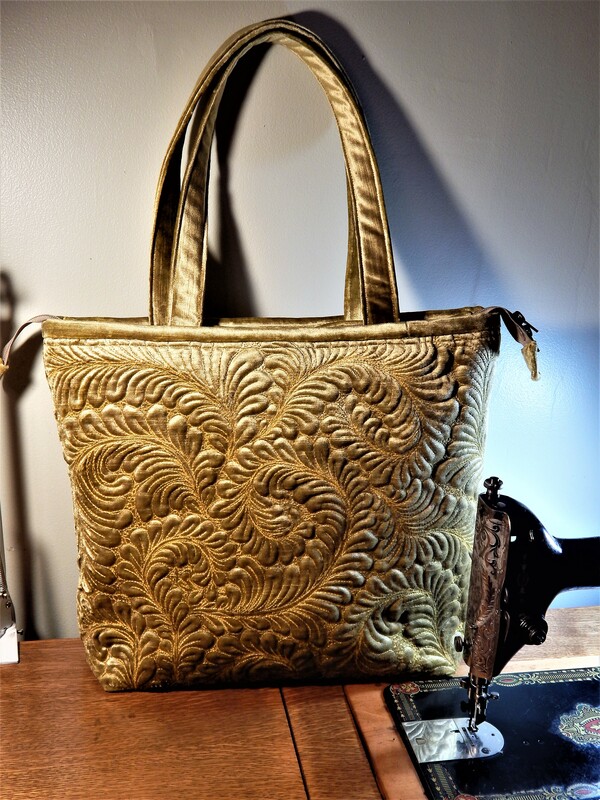 Thank you for taking the time away from your beautiful quilting to educate online Sellers and to write this far reaching blog post. In the end, both of these Sellers will have to live with the consequences of their actions, and one of them will be able to hold her head high and sleep peacefully at night. Amen…that seller who did the right thing warms my heart! Thanks Trish! you are so right….these sellers do everyone a disservice! I know that if they compared them to the beautiful quilts that you offer on eBay they would see the difference! eBay is a microcosm of the world…there are genuinely honest sellers and then there are the scoundrels…seems like you have had a run-in with the latter!! Well done,Tim for your words and shame on the seller for their stubborn ignorance. BTW Trish (above commenter) is one of the truely wonderful eBay sellers. The first seller had integrity and that was a marvellous response from her. What would be disconcerting is that whoever buys the second quilt in good faith may go on to sell later on and so the next buyer could be duped as well. These Chinese imports have had a long lasting effect going back from when they first started importing them. Good job Tim, someone needs to try to keep sellers honest. Thank you from so many potential buyers. the seller of the star changed her mind and told the buyer about it…the Amish one had not responded but changed the listing to say it was bought in Amish country but removed the Amish attribution…so there had been some movement. Thanks, I’ll take a look this weekend and play good cop. Does your Facebook group do many of these policing actions? If so, I suppose I should join. As we know from the past, working as a team is really effective in getting sellers’ attention. If there are more than the two of us, wow, the recalcitrant sellers would not be able to ignore or be reflexively nasty. If I get any responses I’ll send them to you. I don’t know that there is a person overseeing the posting of items (at least based upon the things that I see!) but I think there must be someone in eBay land that might find it helpful …Just wish I could get every potential buyer to read it! I’m not a lover of E bay as I have been ripped off from a seller for $100 and basicaly Ebay did nothing. The seller never sent my item but they kept in communication with me as if they did until it was past the time allowed for complaints by Ebay. His rating was 98% and I realized he ripped off every so often and I just fell into that category. Ebay can be good as I just bought a humingbird whole cloth kit for $10 true vintage and can’t wait to start on my 1st whole kit for my mom who has hummingbirds in her home for decorations.. It is refreshing to see someone do the right thing although it may not be the popular thing. Thanks for being an example and living by the golden rule. 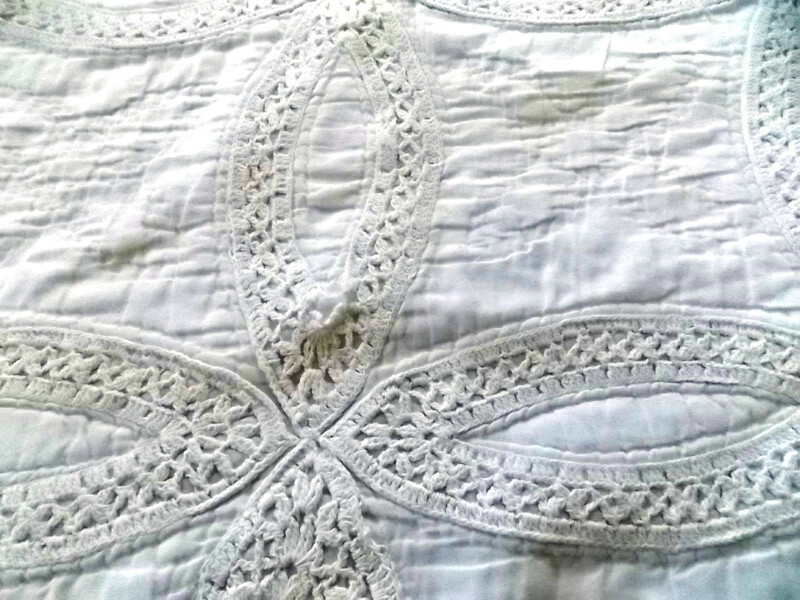 The white on white quilt with the lace is definitely a chinese made quilt. I bought one from an outlet store in North Carolina about 15 years ago. I knew what I was buying and it was just for a summer bedcover. Yes, I quilt, and I know the difference between real and fake. I also came across a small quilt at an auction that looked like a very authentic piece of folk art quilting that almost fooled me. I was surprised that the Chinese were able to copy something that well. I continue to add ore pictures, I find it so amazing how many reproductions there are! It goes both ways. Are you doing it both ways? There are people selling things listed as say vintage or quilt top. Which anyone educated in quilts will know is antique. 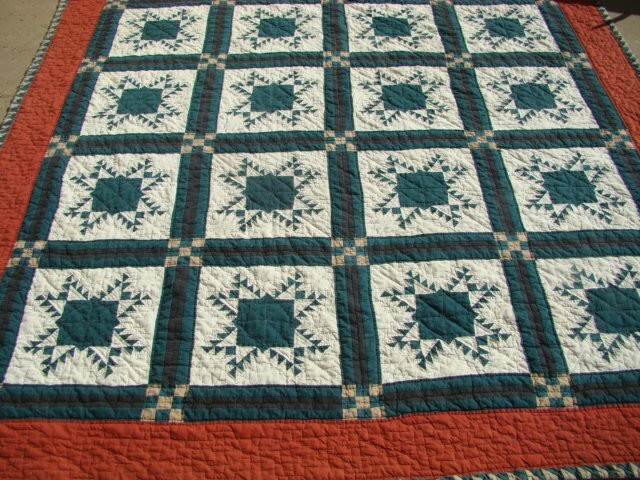 Do you tell that seller there quilt listed as vintage or just listed as quilt top is in fact full of fabric from example1880? Or do you buy it knowing what a bargain you are getting? 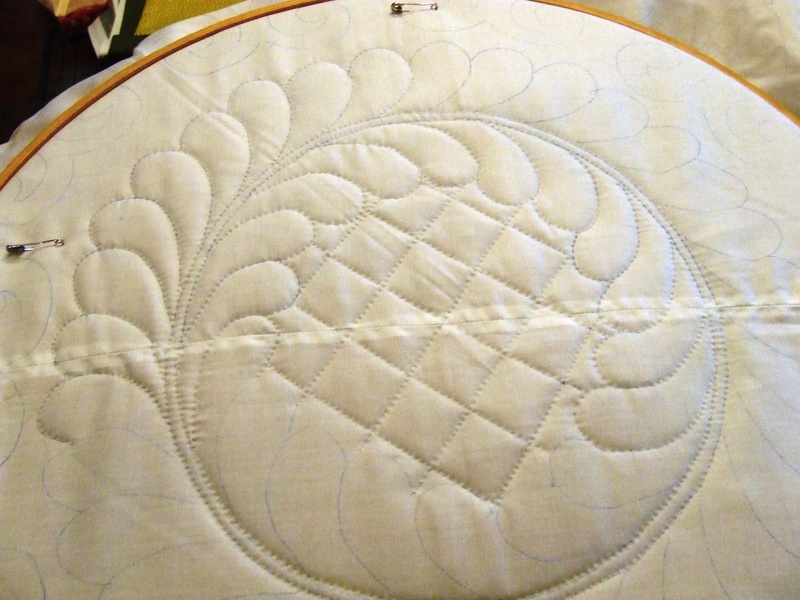 In the case where you pick up a cheap quilt top by someone who has no quilt education do you tell them ahead of time the true value of the quilt top or quilt blocks? Or do you just get it way under its actual value? I find it interesting that you think it is appropriate to be supervising Ebay. To the point of contacting sellers, copying their photos and putting them on your blog. Overstepping is putting it lightly . FYI I have never sold anything on Ebay. Normally I stay quiet but these posts are inappropriate. As a matter of fact I frequently contact sellers to share information about their quilts, including date information, pattern identification, and market value. I am not in any way trying to “supervise” eBay, my goal is to educate the potential quilt buyer about the differences in vintage/antique and modern/imported quilts. reputable sellers appreciate the information and find it very appropriate.